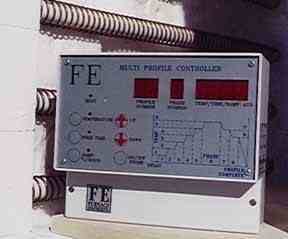 Temperature Controllers are a very important part of any electric kiln. At Furnace Engineering we have a comprehensive range of control systems available starting with the most basic and simple to use controller through to micro processor multi ramp multi dwell fully programmable program controllers. Most temperature controllers are just that and no more , the FE AUTO Multi Profile controller is much more than a temperature controller it is the most advanced KILN controller available today special designed for kiln use. This is a high temperature and low temperature controller with many special safety features build in. When the thermocouple probe breaks or burns out. When the wiring to the probe is reversed. When the probe is NOT inserted into the kiln , this is easily done with TOP loading kilns , this kiln could melt down. When a element fails and the kiln can not reach the set temperature , most controllers will NOT notice this failure and keep on trying to reach set temperature , and in the process it will burn out more elements. When the controller reach it's absolute maximum temperature , this is a temperature which is factory set , to prevent you from over firing the kiln which could result in great damage to the kiln. This setting could be used as a safety for low temperatures if you do glass work , one wrong digit could cost you a whole kiln load. When a fuse fails and the kiln can not reach set temperature , the kiln will be switched off to prevent damage to the kiln. When the pilot flame in a gas kiln extinguishes , it will close all gas solenoids and sound a alarm to notify you that something is wrong or to red light the burner. The FE Auto will START your kiln after a power cut and proceed the firing from where it has been interrupted , without loosing the settings in it's memory (this is ideal if you fire overnight and in some locations with unstable power supply). Unlike liquid crystal display's our bright red digits gives a clear view of the kiln temperature even in the darkest locations and shows you if the kiln is ramping or holding and which step and program is processing. Programmable is a delayed start time , eight ramps , eight temperatures , and eight hold or soak times. There is a variety of 24 pre programmed firing cycles in its memory and ten firing cycles could be made by the user and stored into the memory (most mistakes are made by reprogramming a controller , not so with the FE Auto , once programmed correct , always correct). It not only tells you the actual kiln temperature , it also tells you as what the temperature should be at that moment. It is most important that the lower temperature rise is very gentle , for this reason a SIMMER STAT action up to 300C is build in to reduce cracking and exploding of your ware. The beeper will sound for 15 seconds after the firing is completed , and the kiln is cool enough to be unloaded. The auxiliary output could be used to open and close a vent on top of the kiln (optional on all FE kilns) , this vent could be open , say up to 600 C , so all fumes and moist can escape. Then it could be close from 600 C until the firing has been completed (to safe power) . Then open again to speed up the cooling process. Or this auxiliary output could be used to fire overnight two different kilns , as soon the first kiln is ready the second one could be fired. This controller is ideal for glass casting as the temperature increase and decrease can be set a tenth of a degree , which is required for castings over 100mm ( 4 inch) in thickness. This controller is also suitable for gas kiln use , it will control a two stage burner which gives you a very controlled and even temperature increase. A flame rod could be connected to the controller and as soon the burner flame extinguishes all solenoids will be closed and a alarm beeper will sound to notify you that something is wrong or to red light the burners. A OXY probe could be connected to the controller to measure the oxygen level during the firing which could be displayed in two different ways , in Millie volts and OXY log in which 7 is neutral , all readings above 7 is REDUCTION and below 7 is OXIDATION , this way consistent reduction results can be achieved. If the kiln is ramping the ramp light will be lid , if the kiln is holding the HOLD light will be lid. 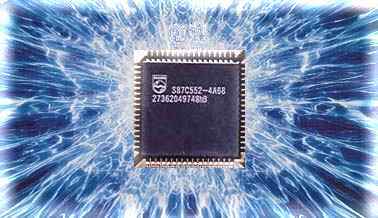 The BRAIN of the machine is this state of the art Philips Micro Processor , as of the rest of the controller only quality components are used . 0 C to 1700 C.
0 C to 1200 C.
0 C to 1300 C.
Flame failure protection probe for gas kilns. Standard response time 5 seconds. 240 Volt AC. max. 10 VA. 50/60 Hz. This output could be switched ON or OFF in each phase. 12 Volt DC output to operate solid state relays. Bright red LED display ,7 digits and 4 single LED's. 10 user programmable profiles (optional max. 40). 24 fixed or pre programmed profiles (optional max. 90). Temperature read out in Centigrade or Fahrenheit. Temperature : Resolution +1 degree C or 1 degree F.
Accuracy + 3 degree C.
Negative Logarithm of oxygen concentration. Display from 00.0 to 99.9. (which is more suitable for pottery application). Adjustable from 0 to 99 hrs 59 min. Adjustable from 0 to 9999 degrees. Thermocouple burnout & Reverse connection protection. 180 mm x 213 mm x 87 mm. This is without any doubt the most advanced kiln controller on the market , so popular one business even has seven in operation on their burnout furnaces.